Having existed in the video production industry for some time now, we’ve become brutally aware of one problem that exists in the quiet grumblings of creative vendors everywhere–clients’ unwillingness to expose their project budgets. Don’t think we don’t understand the clients’ point of view, we know that you’re worried about vendors taking you for all you’re worth. However, the reality is that creative vendors really don’t want to take advantage of you. In fact, here at Dartise Media Design we want to create for you the best possible product that your budget allows. The only goal you’re achieving by refusing to disclose your budget is creating more work for both you and your vendor. Imagine a graph with the Y-axis being budget and the X-axis being quality. Better yet, just look at our entirely unscientific scale below. The scale isn’t perfect, but it shows you a very important factor in producing media content–the size of your budget and the quality of your final product are inextricably linked. Before we explain why this scale matters when talking about disclosing budgets, let’s look at two examples. We’ll begin at the bottom of the scale with car dealership and lawyer commercials. There’s no data to back this up, but from experience we would guess the average cost to produce is around $5,000. 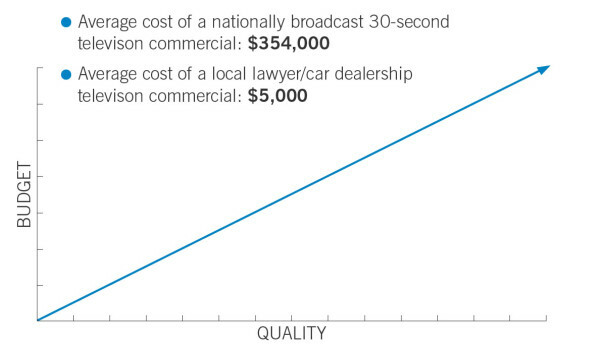 On the other hand, the average cost to produce a nationally broadcast 30-second television commercial. According to a survey from the American Association of Advertising Agencies in 2011, it’s $354,000.